Wolfgang Pike is a man who is not entirely sure of his place in life. He has long thought that he might become a priest, but plan took a detour when he met Rose, and again when he came to work at Waverly Hills. Waverly Hills is one of the top tuberculosis sanitariums in the United States, and with the way the disease is raging, they need all the help they can get. Although he lost his dear wife, Wolfgang cannot bring himself to go back to his priestly studies as long as Waverly needs him so much. Not that there is much that anyone can do for tuberculosis at this point, in the wake of World War I. But although there is little that can be done medically, Wolfgang has faith in the power of music to heal – or at least help – those whose suffering is the greatest. It is with this in mind that Wolfgang begins to build his orchestra, despite the fact that his boss believes the exercise potentially harmful and a complete waste of time. 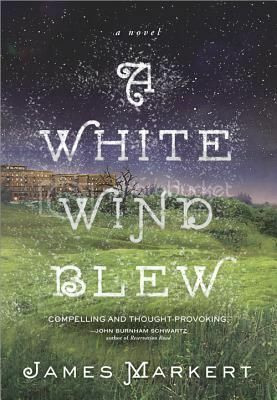 I really, thoroughly enjoyed A White Wind Blew. I am often not super keen about historical fiction set in America (except maybe that set in the 19th century), so I was a bit hesitant. However, Markert has written a book with real heart – and which also benefits from such an interesting setting as a tuberculosis sanitarium. A White Wind Blew is lovely and a very diverting way to spend an afternoon. Recommended. Check out my interview with James Markert in the SheKnows Book Lounge. I’m really interested in this. I do enjoy historical fiction of almost any sort 😉 Especially if I can learn something from it. This one has been on my radar! Glad you enjoyed it. It’s kind of cool when books can surprise you, right? The synopsis sounds so good, especially with such a unique setting. Thanks for the review!